Château Thivin was built in the fifteenth century on an ancient volcano and is the oldest estate on Mont Brouilly. Thivin’s Côte de Brouilly parcels of 50 year old Gamay vines are predominantly south-facing. The soil is plowed and composted regularly and cover crops are left between some rows to encourage microbiotic activity. No insecticides are used. Traditional whole-cluster fermentation is employed. The Gamay for the Cote de Brouilly is sourced from 50 year old vines growing on blue volcanic rock containing plagioclase and biotite. The vineyards are situated on steep slopes with a 48% grade and exposed to the South, East, and Southeast for optimal ripening of the grapes. Fermentation lasts 6-12 days and the wine ages in oak foudres (the large barrels) for six months before bottling. 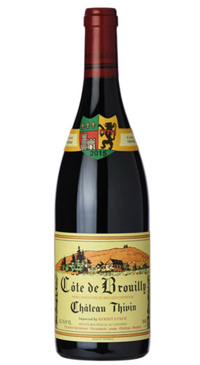 This Beaujolais Cru drinks well in its youth, but will develop beautifully 3-8 years after the vintage.